Increase your facility's resiliency, efficiently, and sustainability with the latest microgrid technology. 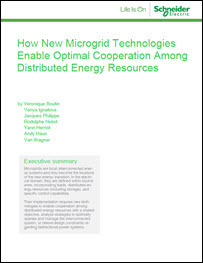 Microgrids seamlessly combine Distributed Energy Resources (DER) with your existing operation to achieve resiliency, optimize energy costs, enhance security and reduce CO2 emissions. When connecting on-site generation and storage assets with traditional grid energy, specific technologies must be incorporated to ensure the highest standard of protection and control. To Learn more about new technologies enabling optimal DER integration, download this white paper.